Google Earth Pro portable comes with the same features and imagery included in Google Earth, as well as an enhanced suite of options designed for business users, more specifically distance, area and 3D measurements, multiple layers, and video recording options. The program allows you to calculate the distance in feet, miles, kilometers, acres and other units of measurements. In addition, you can perform area and radius measurements, determine the height of a building, and measure viewsheds. Google Earth Pro enables you to research properties by zooming in to view parcel boundaries and get information about the price sold, zoning, square feet and other details. Demographic data is shown on thematic maps, more specifically media age, income, and education level for your state, country, census tract or block group. The viewshed tool can be used for detecting and calculating viewpoints, measuring distances, and analyzing a 360’ line of sight with a color code 3D view mode. Plus, you can visualize historic traffic trends on the globe. Google Earth Pro gives you the possibility to import ESRI Shape (SHP), MapInfo (TAB), and Keyhole Markup Language (KML) files, add large image files that are automatically optimized, and split images into tiles. You can import addresses from CSV files and generate thematic maps with custom color, title and height. The application lets you record and save 3D imagery in real time. The video streams can be exported to WMV or AVI file format, or saved as images, and may follow the camera viewpoint to and from multiple locations. Plus, you can publish data on a website or send it via email. Maps can be created directly from Google Earth Pro, and may include legends, HTML, directional indicators, scales and titles. You can print or export the maps to PDF or an image format. Projects may be saved to KML file format. 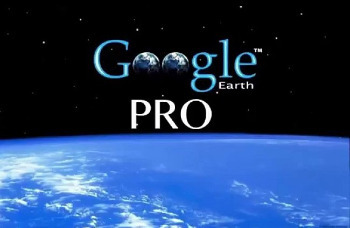 All in all, Google Earth Pro is all worthy of your attention in case you are interested in premium high resolution images, batch geocode addresses, demographic, parcel and traffic data layers, movie creation, polygon or circle measurement tools, viewshed utility, as well as map making feature. • Fly from space to your neighborhood. Type in an address and zoom right in. • Search for schools, parks, restaurants, and hotels. Get driving directions. • Tilt and rotate the view to see 3D terrain and buildings. • Save and share your searches and favorites. Even add your own annotations.